[Video] What Types of Places Could You Live in Mexico? From time to time, my business associate and I like to show you properties where expats, full-time and part-time, live in Mazatlán Mexico. We know it’s rather hard to picture things and thought you might enjoy seeing some of our favorites. Each complex and neighborhood has its own culture and draws its own kind of resident. This first video is of a rather scruffy eight-floor condominium complex at the end of my street. Our sentimental favorite, the age of the building does not detract from the brilliance of its architectural design. The “W” -shaped floor plan ensures that every unit has an equally fantastic view. The design must be an established method of getting the most ocean views out of a residential building. My place in San Diego in the eighties had roughly the same lay-out. This building made it largely unscathed through Mazatlán’s worst hurricane, Hurricane Olivia, in 1975. Part of the brilliance of its open design is its ability to channel and dissipate the force of the water through those open breezeways you see in the video. Today, much fancier buildings exist in the area. The cost for a unit in this building is relatively low ($125,000 to $175,000) but the property management fees do concern me a little, as the fees are about the same as the higher end buildings up the road. We love the funkiness and casual atmosphere of it though, and the friendliness of the staff and people who live here. As you walk with me in the video, notice the bar on the right. Many a night in high season the bartenders are behind it and at your service. The homeowners have frequent birthday parties and celebrations in this space. Many have known each other for years. Remember how you used to play a band's album non-stop in your apartment before going to a concert? The residents and management remember that here too. When I walked through the lobby on the eve of a tribute band’s performance of The Doors at the Angela Paralta Theater in Mazatlán, Jim Morrison’s “Love Me Two Times,” was playing in the lobby, a nice touch representative of the sense of community they have in this particular building. As we walk together down the corridor, you will see the menu board on our left advertising the breakfast and dinner specials that are served in the large, open air restaurant on the second floor twice a week. I come frequently for breakfast; a white linen affair with a wonderfully presented fruit plate, eggs, bacon or ham, potatoes, coffee and breads for less than $5.00. The uniformed wait staff reminds me of being at The Greenbrier in Virginia for Easter brunch. Twice a week, a fixe-prix dinner of steak or fresh fish like swordfish, salad, accompaniments, local flan and two drinks costs around $15.00 (dollars). Since it is open to the public, I usually see at least one person carrying a doggy bag that they wave at me in endorsement of the meal as they board the water taxi that ferries diners back to the resort or the cab stand on the other side of the inlet. Then in the video we walk past the gardens, which are always well-kept. As you can see, the salt air and tropical storms do take their toll, and the walls are a bit crumbly. Repair is constant off-season and they do keep the place up. Keeping up a place so near the water takes quite a lot of work. Outside to the left, the building also has a large pool and to the right a large bricked patio area facing the ocean. El Cid's uniformed wait staff a few hundred yards up the beach will come over and good-naturedly take your order. I would say the residents here have things wired. Next up: Is Mexico Safe? - if it's not, there are a lot of 50+ action heroes living here. Most recent: Vanilla town in America or mocha in Mexico? 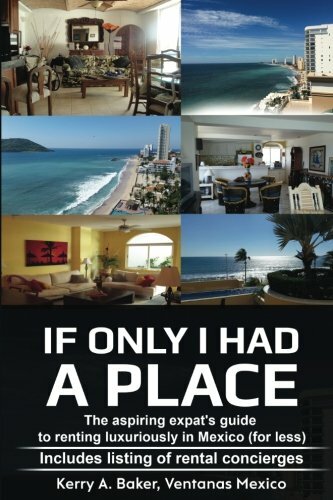 Kerry Baker wrote "If Only I Had a Place," on renting in Mexico, for less and luxuriously. Included is a listing of rental concierges for helping you preview your place before you sign the dotted line - a must! Avoid the pitfalls, find opportunities unique to being an expat. 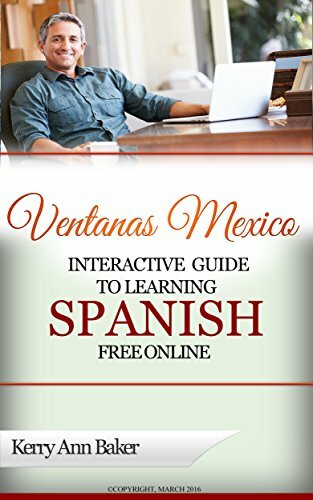 She is also author of the "Interactive Guide to Learning Spanish Free Online," a curation of the best Spanish language tools on the web, linked and organized into lesson plans. Use the books lesson plans or create a new one every day!